Escape the daily grind and join us on a summer holiday to the Spanish Island of Mallorca. We stay at the 4* All Inclusive Zafiro Rey Don Jaime Hotel, in the popular resort of Santa Ponsa, on the island’s west coast – a firm favourite with Solos guests! Our all–inclusive hotel is set on a side street in the enviable location of the popular resort of Santa Ponsa on the island’s west coast. It strikes the right balance: a beautiful sandy bay lapped by clear warm Mediterranean waters with its equal measures of varied daytime activities and nearby refreshments. At night if you decide to venture out from the hotel you’ll find the nightlife is vibrant with live entertainment in Santa Ponsa’s main square most nights. It may be less lively than neighbouring Magaluf but there is a great choice of bars and discos, many with Celtic roots and live music for an infectious craic! A range of optional excursions are possible, including visits to the pretty mountain town of Valldemossa, home to a monastery where Chopin composed over the winter of 1838. Another trip may take us to the Caves of Drach, travelling on subterranean lakes past giant limestone stalagmites and stalagtites. If you choose to take a break from relaxing by the poolside there’s plenty to do if you head into Santa Ponsa and want to explore your surrounds. 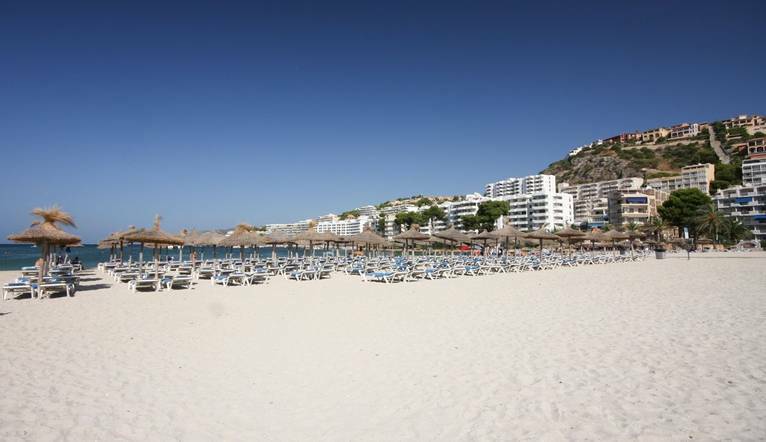 It boasts 2 fantastic beaches with shallow, clear waters. Watersports are available and regular boat trips operate from the main beach and the Marina. Palma, the capital of Mallorca, is approximately 20km away, dominated by La Seu, its buttressed cathedral surrounded by a lovely warren of alleyways, squares and traffi c-free ramblas. Why not grab a coffee and watch the world go by on Passeig des Born, a wide, tree-lined avenue. Our lovely hotel in the resort of Santa Ponsa is ideal for those wanting a relaxing sun holiday or to explore the island. Head down to the beach, just 200m away, or soak up the rays beside the hotel's lagoon-style swimming pool. Other facilities on offer include a lounge bar, pool bar, buffet restaurant, games room, table tennis, darts and adults-only rooftop pool. The stylish bedrooms feature air-conditioning, satellite TV, telephone, kettle, hairdryer, balcony or terrace, safe and Wi-Fi (extra charges apply). The transfer from Palma airport to the hotel is approximately 40 minutes. Some optional tours may be available to you during your stay depending on the time of year and numbers interested. Full details of all the excursions available will be advised at the Information Meeting. Prices may vary, depending on numbers etc and should be used as a guideline only. All tours should be paid for in euros only. Your Tour Leader will help arrange these for you but may not necessarily accompany you. This tour takes us to the east coast of Majorca, to the charming little fishing village of Porto Cristo. Here the caves of Drach are situated, which contain some wonderful rock formations, all cleverly illuminated, and the largest underground lake in the world. A concert is played from little boats on the lake. This trip also includes a tour of the MAJORICA PEARL FACTORY. There is time for shopping and sight-seeing in Porto Cristo. This pretty little village is situated in the hills to the north of Palma and contains the old Carthusian Monastery known as La Cartuja, also the old Palace of King Don Sancho. These buildings date from the 14th century and are fascinating to visit. Inca, situated in the centre of the island, is Majorca’s third largest town and the centre of the important leader industry. Its weekly street market is the largest of the island with a wide variety of goods that are brought to market, and it is great fun to browse around. There is time for a visit to one of the leather factories. By coach to Palma and thence to Soller, through Soller´s orange groves, by the charming little electric railway, one of the oldest in the world, on by coach to the Port of Soller and from there by motor-cruiser to La Calobra where a walk through a little tunnel cut through the rock takes us to the "Torrente de Parells" which is a great chasm. Return by coach through the olive oil producing region of Majorca, with wonderful views of Arab terracing for the cultivation of olive trees, which are still in production. Son Amar is a 13th century country mansion whose interior has been completely redesigned as a modern and luxurious night club which offers an excellent dinner and a first class variety show. A guided tour of Palma starts at the Parc de al Mar and walks towards the Cathedral and then onto the market. Stops along the way include the town hall, the main city square and San Miguel Church. Enjoy a truly memorable day on a sailing catamaran. Set sail then drop anchor at a secluded cove where you can swim and snorkel in secluded waters. Discover the beautiful southwest of Mallorca while enjoying an included buffet, sangria and live guitar music aboard. Your Tour Leader will be on hand to offer advice or suggestions if required but gratuities are offered entirely at the sole discretion of the individual. We suggest a group collection to cover drivers, porters and hotel staff of €15.00. Your Tour Leader will collect this on your behalf and distribute it accordingly, thus relieving you of the burden of who, when and how much to tip. The tipping of housekeeping will be left to your individual discretion (a small amount left in your room on departure should cover this and would be much appreciated). As is customary, ‘the hat’ will be passed around for the driver and guide on all optional excursions. For any meals that are not included in your itinerary, or taxi fares, your Tour Leader can advise of an appropriate Ͽo add on. Casual, cotton, lightweight daytime wear is the order of the day. Comfortable shoes are a must for sightseeing. Smart casual clothes will be ideal for the evening, with the emphasis throughout being informal but with no shorts or vests in the restaurants in the evenings. Early and late season evenings can be cool so do ensure that you take a cardigan or jacket and even some rainwear – particularly in May and June when you may experience some spring thunderstorms followed by scorching days! Beach Towels are available for hire for 10 Euros with a refundable 5 Euro deposit.